Update: Please note that the original extension is not available anymore. We suggest that you use Facepaste instead. It is also available for Firefox. After you have installed Facepaste in Firefox and restarted the web browser, you can make use of the extension immediately. Visit the photos page of a Facebook user and right-click on the page. Select download Facebook albums from the context menu. This displays a configuration window that you use to define what is being downloaded. The add-on displays the albums that it has discovered on the left side, and options on how to save them on the right. You need to select a download directory first and several options in regards to output file names and how to handle existing albums afterwards. A click on start finally initiates the download of all selected albums and photos. If you are a Facebook regular with a solid amount of friends and activities you may have thought about downloading some of the contents, especially pictures but other multimedia content would do as well, from Facebook to the local computer. Think of photo albums that have been uploaded by friends, family or colleagues. It is possible to manually download individual photos from Facebook but it would surely be a time saver to download them all at once. Facebook Photo Album Downloader is a Firefox extension that can download an entire Facebook photo album in one go. The Firefox extension is actually pretty easy to use. 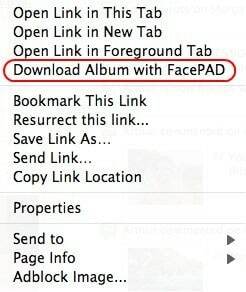 All the user has to do is to right-click the View Album link on Facebook and select Download Album With FacePAD. Google Chrome users can check out Download FB Album mod for the web browser to download which offers a similar download experience. 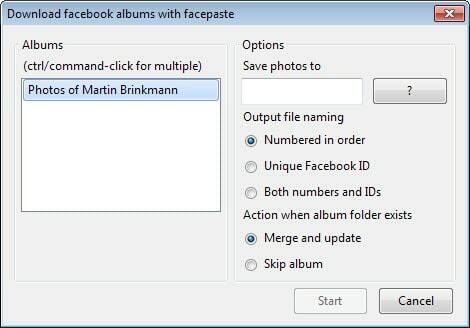 How to download entire Facebook photo albums with a couple of clicks. Facepad is no more, it had its name changed to photojacker for a short time but then recieved another takedown notice which spelt the end to the popular addon. u should be glad if theres one for firefox..